Learn all you need to know about this years Ultra Music Festival. 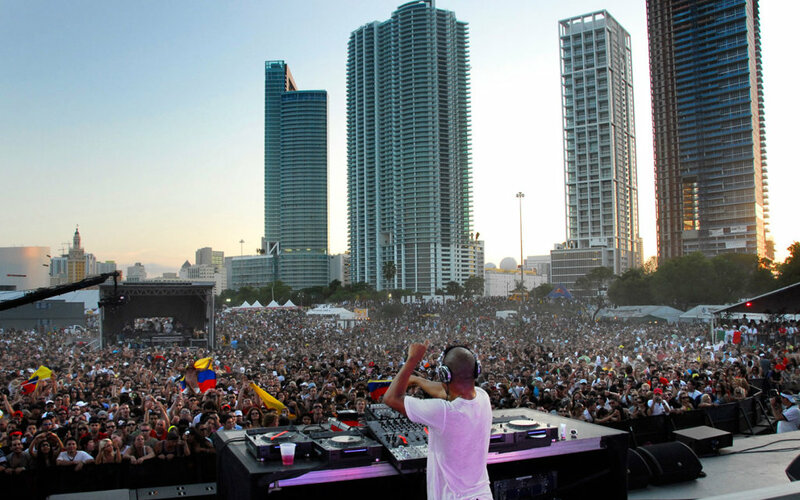 Party people from around the world escape rainy, gray springtime and descend on sunny Miami in late March for the annual Ultra Music Festival, a three-day electronic dance music (EDM) party. Attracting over 70,000 music-lovers, the festival started two decades ago as a small one-day party on South Beach to cap off the Winter Music Conference. This year marks the 21st edition of Ultra, the world's premiere EDM festival spawning Ultra festivals in Japan, Brazil, Croatia, South Korea, South Africa, and other countries. The Miami festival, however, is still the biggest and baddest, returning to historic Virginia Key Beach for another epic year. Expect a high-energy crowd relishing in a euphoric dance experience with major pyrotechnics, confetti and lasers. Lots of lasers. Enough to put your cat in a straightjacket amount of lasers. Ultra has released the Phase 1 & 2 lineup for 2019, and it does not disappoint. Find your favorites like David Guetta, Marshmellow, Afrojack, Zeds Dead, The Chainsmokers and Galantis, among others. Be sure to check out the 2019 Resistance lineup as well. Artists perform on one of eight stages located throughout Virginia Key. Stage-hopping is a must to experience the full range of Ultras EDM vibes. Move that body to the best DJ sets and drop in on the Live Stage to catch the rhythm of drums, guitar, synths or vocals. Rave, rave, rave away. Musicians choose Miamis Ultra Music Festival to debut new music because of its vast international audience, festivalgoers are among the first lucky enough to hear the latest soon-to-be hits before they hit the radio. Every single stage is packed with the best EDM talent spanning the globe so no matter which stage you stumble upon, youll be exposed to the beats youll be thumping to the rest of the year. Virginia Key is located on Key Biscayne overlooking Biscayne Bay. There are many hotels a short drive away in Downtown Miami and Brickell that are popular among festivalgoers. Public transportation, taxis and shuttles are highly recommended. Be prepared for festival traffic. Come prepared for delicious rays of sunshine and note that breathable clothing is best (neon colors are welcomed). Wear sunscreen and stay hydrated, luckily there are places throughout the grounds to refill water bottles. Most onsite vendors only accept cash so visit the ATM beforehand or find stations on the grounds. Have fun and think safe. Dont fall prey to pickpockets. Fanny packs are back in style and keep the carefree joy of Ultra alive. While Ultra is no doubt a major Miami Music Week event, the entire city is filled with incredible parties and satellite experiences. It's possible to see your favorite DJs in more intimate settings throughout the week. If festival plans change but Miami is still the main destination, there will be plenty of amazing things to do during Miami Music Week®. Download the Ultra app to find out about special guests and surprise appearances at the event. These special guests have included the likes of Cashmere Cat, who ended his set at the Worldwide Stage with a surprise vocal performance from Ariana Grande, Madonna, Diplo Kiesza and P. Diddy, among others. Don't expect these appearances to be advertised in advance either, as these are only announced minutes before they are scheduled to take the stage via Twitter or a push notification from the official Ultra app. Hotels often sell out, so plan in advance. Lodging homework is a must. The best places to stay are Key Biscayne, Downtown Miami, Brickell, Coconut Grove or near the MIA Airport. If visiting for two days or less, staying in hotels close to the festival is the best option. One of the more convenient aspects of Ultra Music Festival is its close proximity to Downtown Miami, meaning the event is minutes away from dozens of large hotels. After being on your feet for hours, youll definitely want the ability to leave Ultra and be comfortably within your hotel room in as little as 15 minutes. Those who make the festival a week-long vacation tend to choose a luxury hotel on South Beach, stay for the entire week, attend Miami Music Week® parties and events during the days leading up to the festival and secure transportation to and from South Beach to the festival each day. Its the best way to party and experience Miamis beach lifestyle. Keep in mind travel time if leaving Miami Beach for Virginia Key (add a few more minutes to the trip for holiday traffic). There are great hotels near Coral Gables, South Miami or near Miami International Airport to consider during the festival week. Many of them are conveniently located near public transport, which takes the headache out of Miami traffic. Budget-conscious travelers should look into these areas to get the most bang for their bucks. Staying within walking distance of the festival is always optimal but not always an option. There are some affordable hotels near Miami International Airport within walking distance to a MetroRail Station. The trains have extended hours so partygoers can get home or to their hotels without the need to drive, take a taxi or use other ride-sharing services. Staying on Miami Beach? Enjoy the waterways via a water taxi that takes passengers by boat from South Beach to Virginia Key. Check the schedules in advance to be on time to enjoy the lineup. Choose from General Admission or VIP tickets for the Ultra Music festival. Both options admit festivalgoers for three days (single-day tickets are not available). Every ticket grants access to all eight stages with the exception of a few exclusive areas dedicated to VIP. Find out more official Ultra Music Festival ticket details.